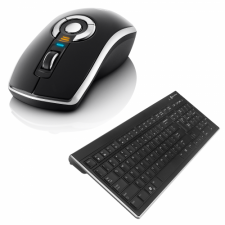 Get the best in computer control with the award-winning Air Mouse GO Plus with Low Profile Keyboard. Control your PC or Mac using GO Plus as your desktop laser mouse and keyboard combo, or in the air with Gyration's patented in-air motion-sensing technology. Diver presentations, lectures and Internet browsing sessions from up to 100 feet away with just the wave of you hand. Adds interactivity to business presentations and classroom lecutres.